The Marsh KONG is constructed of a huge 30mm diameter aluminium barrel with extra large chisel tip for marking up to 15mm. Perfect for metals, glass, plastics, rubber, concrete, wood, boxes, textiles, cardboard, and packaging materials. 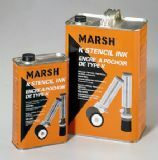 The 22ml of Ink is UV and weather resistant, Xylene free and Prop 65 compliant.